(CBS) Parents don't think they are dangerous. But spa and pool drains are serious hazards for children. Wednesday morning, the U.S. Consumer Product Safety Commission will release a list of hidden hazards at home, and pool and spa drains are one of them. CPSC Acting Commissioner Nancy Nord addressed this issue on Wednesday's The Early Show. On Saturday, a 6-year-old boy from Greenwich, Conn., drowned in his family's backyard pool after his arm got caught in the intake valve. 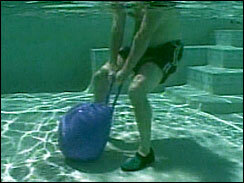 Although the boy was described as a strong swimmer, he was unable to escape from being trapped in his family's pool. Everything from feet, hands and even hair can get caught in a drain and trap kids, and even adults, underwater. "There can be incredible suction created down by the drain as the water goes from the pool through the circulation system and then back into the pool," Nord said. "Body parts (and) hair can get caught in the drain and, when that happens, a child can drown." Drain accidents are not very common, Nord said, but they occur with enough frequency that the CPSC wants to bring this issue to the attention of parents. Some pool drains are more dangerous than others. Older pools only have one drain, which means there is greater suction. Newer pools have more than one, which decreases the suction. The older, more dangerous drain covers are very flat and can be covered by your entire body. They look like the drain at the bottom of a shower. New drains are dome-shaped, which cuts down suction and makes it more difficult for hair and limbs to get caught inside. The CPSC recommends the newer drain covers for your pool. There are ways for parents to be cautious. Nord recommends installing a Safety Vacuum Release System. It will sense when a drain is being blocked and will shut the whole system off, Nord said. But not all pools have this system, so it's important to know where the actual pool pump is located. In case of emergency, you will be able to quickly shut it off to stop the drain's circulation.